We like do-overs — second chances. They give us hope that we can make things better. This is the time of year millions resolve to start doing, stop doing, and keep doing whatever they believe will improve themselves. I’ve done it myself. Unfortunately, most resolutions made on January 1 are abandoned by February 1. This Psychology Today article will help you understand why. The sweet thing about being alive is that we are alive 31,536,000 seconds a year, each and every year. (Every four years we count an extra 86,400 seconds to catch up our clocks.) Why procrastinate until the new year to make these improvements? What makes us think that by resolving at the first of a new year, that resolution will have any more impact than on any other day or second of the year? The INPowered don’t need New Year’s resolutions, because they know every second is an opportunity to realize we can do better and take action to make it so. What do I WANT and WHY? What are the specific results I seek? What is the driving force to achieve it? What must I DO to get what I want? What are the steps and tasks involved to make it happen? Am I ABLE to do what it takes to get what I want? Do I have the resources? If not, how will I get them? Am I WILLING to do what it takes to get what I want? Am I passionate enough about what I want to stick with it regardless of how difficult it might be? Read this earlier post in which I explained motivation. Now, be honest about your resolution, and go for it. For me, there is more joy in giving gifts than in receiving gifts. When I look at it, I understand the phrase, “It’s the thought that counts.” For weeks before Christmas she kept telling me that she could hardly wait to give me this gift. Her joy was in the giving. The gift is not the gift. It’s what the gift represents. The joy I find in giving is thinking about the person who is receiving my gift – our relationship, why they are special in my life. The joy I find in giving is in simply being able to give something special to someone and wanting them to have it for no other reason than I just want them to have it. The joy I find in giving is that it does not require a special occasion such as birthdays, religious holidays and festivals, St. Valentine’s Day, or any other “gift expected” occasion. I am free to give anytime I choose to whomever I choose. The joy I find in giving is that the most precious gifts are not purchased, but shared life experiences — the moments that become memories. Shel Silverstein gave the world his story, The Giving Tree, in 1964. I have given this book as a gift many times because of the simple power of its message about the true spirit of giving. If you have not read this special story, here is a gift from me: follow these links to purchase your own copy: Amazon.com or Barnes and Noble. INPowered giving is taking the initiative to make life better for someone else because you can. Jesus, the reason for the Christmas season, gave. One of the most touching stories is of the leper who came begging Jesus for healing (Mark 1:40-45), “If you are willing you can make me clean.” A compassionate Jesus replied, “I am willing.” Jesus gave simply because he could. In a previous post, I wrote that life is art, and an artist gives of herself or himself in the work they offer as an expression of who they are at their core. This is a gift. And giving of oneself to a life purpose is a personal and individual gift we all can give to the universe. The Teacher in Ecclesiastes wrote: “I know there is nothing better for men than to be happy and do good while they live. That every man may eat and drink, and find satisfaction in all his toil – this is a gift of God,” (3:12, 13). I refuse, REFUSE, to live a paint-by-number life from this day forth. Instead, I pledge to devote my life to the art of INPowerment. Take that pledge with me. The canvas is blank, and I get to decide what goes on it and whether I approve. Soar. Push the limits. See what you can do. Challenge God to notice. That’s the real message of the parable of the talents Jesus taught (Matt. 25:14-30). The master gave resources to three of his servants, according to their ability, and left them alone to see what they would do. He only expected them to work with what they had. Two did; one did not. Two soared; one never tried to get off the ground. The loser had a limiting belief that the master was cruel and harsh, and playing it safe was the right strategy. The others refused to conform to that erroneous belief. They were transformed in their thinking and action. The paint-by-number life fools you to believe that, by staying in the lines and using the prescribed colors provided in the kit, you are an artist. This is exactly what being conformed to the world means. Play it safe, and you’ll be taken care of. Don’t rock the boat. Standing out is risky. Stay in the lines and use the expected colors as instructed. The paint-by-number life is the lie that you must limit your expectations to what is approved of by those in authority — the litany of masters to whom we bow. Afraid to be noticed. The artist takes the abilities she or he has, regardless of how few or many, and does something with them that is an expression of who they are at their core. The INPowered believe they can make life better for themselves and others and take positive action to do so. Your art is your narrative of being alive: your song, your story, your painting. Your art is your statement that you are alive. Your art keeps getting better the more you work it and test it and offer it. In shows in everything, EVERYTHING, you do at work, at play, at home, in your community – everywhere, every day. Your art is your gift to humanity and the universe. It is who you are. Many wonderful and inspirational stories about Nelson Mandela will be shared as the world remembers and honors his life. No doubt, he made a profound difference globally. Purpose: Mandela got involved in anti-colonial politics in his native South Africa. Passion: He became a fervent, energizing leader in the movement. Persistence: Mandela persisted in his opposition activities although arrested repeatedly and tried for treason. Eventually he was convicted of conspiracy to overthrow the state and sentenced to life in prison. Perseverance: Mandela spent 27 years in prison. His release came because of international efforts. Pay off: Mandela helped negotiate an end to apartheid in South Africa, and was elected the first black president of the country. To what purpose will I devote myself? What matters enough to me to motivate me to get involved? To what level of intensity, or passion, will that purpose boil? Passion spills out to those around us. We cannot be quiet about it. We cannot hide it. Others will be touched by it. Do I have the persistence to allow that passion to mature into everlasting enthusiasm for the purpose to which I have given myself? Do I have what it takes to persevere when there doesn’t seem to be a way forward, or when the obstacles become so burdensome that I want to quit? Do I believe in the pay off? Can I imagine what it will be like to have finally succeeded in my purpose? Can I taste the sweetness of success long before others can imagine it with me? 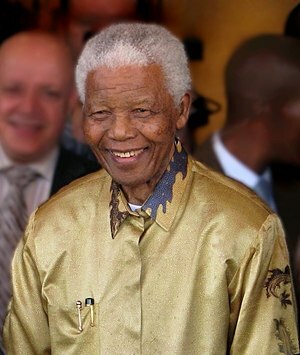 Nelson Mandela lived an INPowered life, and he INPowered others to live one too. The INPowered know they don’t have to change the whole world to make a difference. They only need to change theirs. We learn to be a leader the same way we learn to live﹣by trial and error, through relationships, by paying attention and being present in our moment-to-moment experiences. I invite you to discover an innovative genre of leadership development literature using the power of storytelling to make being INPowered2 LEAD come alive in your life. Meet MARCUS WINN, a fictional Gen-Y supervisor who must navigate through a workplace transitioning between competing world views and expectations. His experience unfolds through a series of episodes, each highlighting specific management and leadership issues integrated with his on-going personal life events — the way life happens. As Marcus discovers, leading and managing is a lifestyle, not a job delineated by bullet-point duties. Life flows. Therefore, his narrative of growing into an INPowering way of living weaves leadership principles into the fabric of experience. Marcus’s lessons come from his environment — not from a menu of how-tos, but from a myriad of what-ifs brimming with possibilities. The first two episodes are ready for you to enjoy and use for yourself. They also make a great gift for anyone looking to unleash the creative energy of personal INPowerment. Read the first chapters free of Marcus Winn’s Moment of Truth and Marcus Winn’s Quest for Clarity available to download from the INPowered2 LEAD website welcome page. When you purchase the soft-back from Amazon.com you can get a copy for your Kindle at a reduced price. The third episode, Marcus Winn’s New Way to Lead, will be released early in 2014. More about that in a future post. Start your own workplace story of an INPowering life.